An inaugural boat race on the much-neglected Los Angeles River is a first; the event is produced by LA River Expeditions. Prior to the scheduled Labor Day weekend event, racing on the river has been, historically, restricted to motorized vehicles during film shoots. LA River Expeditions, a leader in recreational kayaking on the Los Angeles River, will host an inaugural LA River Boat Race. The first-ever event will take place on August 30, 2014, Labor Day weekend, between 11am-3pm, at the Glendale Narrows recreational zone in the Elysian Valley. Los Angeles city council member Tom LaBonge will kick off the river celebration, which will feature honorary celebrity kayakers, such as Ed Begley, and about 100 contestants. Kayakers, canoeists and stand-up paddleboarders will tackle a 3/4-mile stretch of leisurely rapids and flatwater from the start at Fletcher Drive down to Marsh Park, competing for top times and awards in various age- and skill-level categories. Tickets to participate in the paddling event are pay-what-you-can / suggested donation; space is limited and first-come, first-served. Spectators are encouraged to attend the ceremonies and watch the festivities from the banks of the river. Prior to the scheduled event, racing on the river has been, historically, restricted to motorized vehicles during film shoots. The impending race proved too enticing for Conan O'Brien, who quipped on his show: "Next weekend, Los Angeles is holding its first river boat race. All that's missing is a river in Los Angeles with water." LA River Expeditions founder/president, George Wolfe, responded, "Challenge accepted. You show up on the LA River; we'll provide water and kayaks." The river is in the midst of a widespread revitalization. Regulatory authorities and politicians have warmed to the idea of people engaging with their river, especially since 2010 when it achieved federal Clean Water Act protections. A picture of Los Angeles mayor Eric Garcetti, in a kayak on the LA River, now greets visitors as they disembark from their flights at Los Angeles airport. A federal program, still in the approval stages, is likely to send more than $1 billion in federal and local money to help revitalize the urban river. With this kind of attention, and an increasing number of activities like the LA River Boat Race, the river’s nascent rags-to-riches story may yet have a Hollywood ending after all. Media should contact BoatRace_Media(at)LARiverExpeditions(dot)org or call (909) 529-2569. 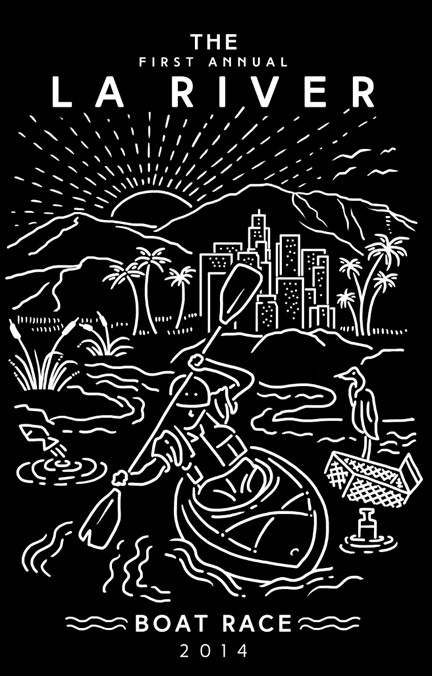 Los Angeles River Expeditions reconnects people to their waterways through recreational boating, environmental education and creative advocacy. Over the past four years, they’ve been involved in guiding thousands of people on the river in their popular guided kayak tours, including underserved populations and youth. For their river conservation efforts they have received numerous commendations. Contact: Info(at)LARiverExpeditions(dot)org; http://LARiverExpeditions.org. The Electric Lodge is LA River Expeditions’ 501(c)(3) nonprofit sponsor and has been committed to creative community solutions and environmental education since its founding in 1999. Contact: info.electriclodge(at)gmail(dot)com; 310.306.1854: http://electriclodge.org.